Electric cars have become very popular once again, after a long gap, because of low carbon emissions and consequently, less pollution. Many car owners prefer to undertake conversion of gasoline-powered car into an electric or hybrid vehicle at home instead of buying a new one as converted cars are much cheaper compared to buying a new electric car. Electric car conversions are normally treated as Do It Yourself (DIY) projects. Those interested in conversion of their vehicles into electric cars can either purchase pre-assembled kits or complete do it yourself instruction manual for conversion to electric car. Certain parts of the car need not be changed during conversion to electric vehicle. These include body of the car, brakes, parts that are meant to enhance the safety of the car and several components other than the engine. Conversion of gasoline-run car into electric –powered one has several advantages as well as disadvantages. It is, therefore, advisable for those contemplating to switch over to an electric car to consider a few aspects before actually taking up the conversion work. In electric cars, the carbon emissions will be minimal and therefore, are eco-friendly. One need not to go to a gasoline station to fill up gas. What is required is to plug-in the car battery to run the electric car. The cost of conversion from gasoline-powered engine will work out to less than $ 15,000. The greatest advantage of electric car is that the maintenance costs are very low compared to vehicle powered by gas. Electric car is much more efficient than an internal combustion car. Although the conversion process involves certain mechanical skills, it is still quite easy to do with the help of ‘do it yourself’ manual. The conversion process will not take much time, if step by step conversion instructions are followed. One can drive an electric car up to a speed of 65 miles per hour. Most of the people are able to convert their cars by themselves, though the conversion depends on the weight of the car and how many batteries does the car require. Charging the car batteries is not costly. What is required is only plug in the car for charging. There is no sound pollution from electric cars. Electric cars are safe and comfortable to drive. Electric car conversions are not usually undertaken by authorized service dealers for normal vehicles. Conversions are normally carried out by the car owners themselves at home. Financial benefits, such as tax rebates, incentives from government etc. are available only to new electric cars and not to the converted ones. Electric cars are more difficult to repair, if a familiar mechanic is not available and regular maintenance could be even more difficult. The electric car conversion kits are not standard ones and are not approved by car manufacturers. Converted electric cars need replacement of batteries every few years, which is an additional maintenance cost. Converted electric vehicles cannot normally run for more than 200 miles without a charge. Though traveling short distances is not a problem, for long trips converted electric cars may not be suitable. 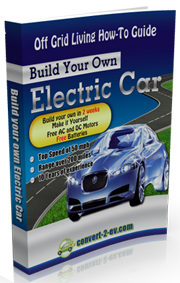 After evaluating all the advantages and disadvantages and you are still keen to start your own electric car conversion project, the next step is to get a DIY electric car conversion manual. One of the EV conversion guide that I really like is the Convert2EV ebook by Les and Jane Oke from Canade. Click on the link below to check out their web site. ==> Click here to visit the Oke’s web site!